Quick story: When Gilbert Arenas was a rookie in Golden St. I walked into the Warriors locker room to say hello to Jason Richardson (who I'd met at his workout for Grizzlies). I was talking to Richardson when Arenas (who is sitting in locker right next to us) says, "Chris Vernon!" He appeared to be genuinely excited to see me. I said - "Hey Gilbert, how do you know who I am?" He responded- "I don't, I'm just reading your media pass." The goof was on me, but I've liked the guy ever since. 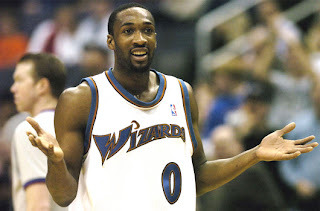 If the Grizzlies sign Gilbert Arenas, I'm all for it. When you hear me get upset over guys playing or the Grizzlies signing guys, it is because they can't play. If Arenas can't play and yet is getting a bunch of minutes, that would be a reason to be upset. My bet is that he can play. A lot of people have asked if he could mess up the chemistry and my answer is that I'm not worried about that. Lionel Hollins is an empowered coach. He dealt with Allen Iverson and last year he dealt with Jason Williams being added to the team last year. I simply do not believe that Hollins would allow something to screw the team up. Arenas was once one of the most likeable guys in the entire league. In between injuries and the horrible incident in the locker room in Washington his career really went downhill. I don't think Arenas is bad guy and his teammates always seem to love him. I'd love for him to get his career back on track in Memphis. If he can't, Hollins will get rid of him. If he can, the Grizzlies will have a veteran back-up PG that can stretch the floor, guard big guards, and can hit big shots. I see very little risk with a possible fantastic reward.